Let’s be honest. If you are like most Shelby folks, you’ve probably put off going to the dentist at one time or another. Some of us have even avoided seeing a dentist for years at a time. In fact, one in three Americans avoid going to the dentist regularly. After a while, that time spent away from Dr. Miller’s chair adds up, and so does the cost of dental work. You start to feel and even see that your teeth are not in good shape. Plaque and tartar buildup, toothaches, sensitivity to hot and cold, bleeding gums, deep, dark stains, perhaps even loose, clearly decaying teeth. Either way, by the time you get to this point you are probably wondering – is it too late to see the dentist? 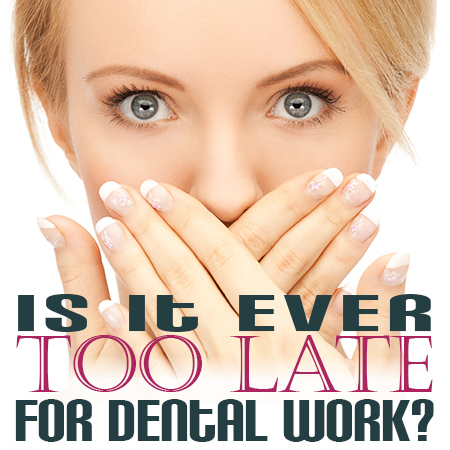 It is never too late to seek dental care! No matter how old you are, what condition your teeth are in, or how long you’ve been avoiding a trip to your local Shelby dentist, there is something we can do to help. Even if you are missing all of your teeth, we can still help restore your oral health, smile, and quality of life. One of the number one reasons people avoid the dentist is for fear of the cost. The longer you wait the more expensive it gets and the more time you will have to spend in Dr. Miller’s chair. Maintaining a beautiful, healthy smile! At Discovery Dental we put your oral health needs first, so we really mean it when we say don’t hesitate to ask us any questions! We offer everything from simple fillings to full mouth rehabilitation services and we’ll work with the needs of you and your family to give you the healthy, radiant smile you deserve.